More than three times as many Americans see a media tilt in favor of Democrat Barack Obama than toward Republican John McCain. A Rasmussen Reports telephone survey released Monday, of 1,000 likely voters, "found that 49 percent of voters believe most reporters will try to help Obama with their coverage, up from 44 percent a month ago," compared to a piddling 14 percent who "believe most reporters will try to help John McCain win" while "just one voter in four (24%) believes that most reporters will try to offer unbiased coverage." Exactly half, 50 percent, "believe the media makes economic conditions appear worse than they really are," a separate Rasmussen Reports telephone survey posted on Monday determined. That poll discovered "a plurality of Americans (41%) similarly believe that the media has tried to make the war in Iraq appear worse that it really is, while 26 percent say reporters have made it look better than reality and 25 percent think they've portrayed it accurately." 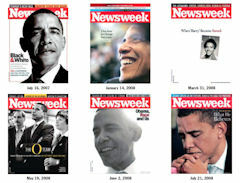 Meanwhile, the "Scapbook" section of the latest (July 28) edition of the Weekly Standard magazine dubbed Newsweek "Obamaweek" and illustrated the media's infatuation with Obama by displaying images of six Newsweek covers featuring Obama, five of them just this year. Good Morning America co-host Diane Sawyer on Monday quizzed John McCain on whether the media are gushing too much over Barack Obama's Middle East trip. She then proceeded to cite Obama talking points on the visit. First, Sawyer wondered: "A quick question about the press coverage, if I can. [Obama's] there with a lot of reporters and it's been widely reported-" At this point, the Arizona Senator started chuckling. A surprised Sawyer continued: "You're laughing. Do you think the press coverage is unfair?" McCain wryly responded: "That's up to the American people to decide, Diane. It is what it is." A few seconds earlier, Sawyer appeared to preemptively answer her query on media bias. The ABC journalist prompted: "You have criticized Senator Obama in the past for not going to Iraq and getting a fresh assessment. He is in Iraq as we speak this morning. Does this take care of it?" The subtext of the question sounded very much like "He went to Iraq. Will you leave him alone now?" At the top of Monday's CBS Early Show a full six minutes of coverage was devoted to Barack Obama's world tour, while only three minutes was given to a John McCain interview. During the interview with McCain, co-host Harry Smith wondered: "You know, when you have the network anchors chasing your opponent across the Middle East it's a little hard to make news. What is your strategy to get folks to pay attention to your message over the next couple of days?" Co-host Maggie Rodriguez asked a similar question to Republican pollster Frank Luntz on Friday: "Can John McCain even compete next week?" The coverage Monday of Obama consisted of co-host Julie Chen talking to New York Times Baghdad correspondent Richard Oppel, followed by a clip of CBS correspondent Lara Logan's interview with Obama in Afghanistan. Oppel highlighted recent news of Iraqi Prime Minister Nouri al Maliki supporting Obama's troop withdrawal plan: "...he was quoted accurately. He did express a clear affinity for Obama's 16 month proposal." The New York Times isn't about to give John McCain a break, setting stringent standards before it will take a pro-surge op-ed from him, even though it printed Obama's pro-withdrawal op-ed last week. When Hillary dropped out under a wave of hostile coverage, she left John McCain the only person standing between Barack Obama and a history-making presidency. With Obama rocking waves of positive coverage overseas, the media tide is out for the Republican nominee, and the Times surely isn't going to give McCain any breaks now. The same New York Times that endorsed McCain (albeit in hold-your-nose fashion) during the Republican primaries now refuses to run an op-ed by him that: laid out recent successes in Iraq; said Obama was wrong in opposing the surge; and accused the Democrat of having "learned nothing from recent history." Times' op-ed editor David Shipley, a speechwriter for President Bill Clinton in the 1990s, e-mailed McCain's staff: "I'm not going to be able to accept this piece as currently written." 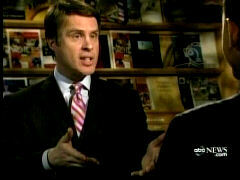 ABC's Terry Moran, who back in 2006 was already enthralled with Barack Obama ("You can see it in the crowds. The thrill, the hope. How they surge toward him. You're looking at an American political phenomenon"), on Monday night from Iraq refrained from such infatuation as ABC's World News, nonetheless, gave Obama a lengthy platform to espouse his Iraq policy. Moran began his lead story by trumpeting how "Barack Obama came to Baghdad, and he brought his star power with him. 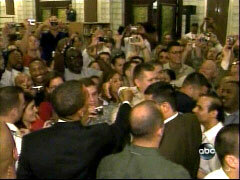 Hundreds of U.S. troops and State Department personnel mobbed Obama at the embassy here." The rest of Moran's story, however, focused on "what has become an open disagreement between military commanders here and Obama, over his plan to withdraw all U.S. combat troops from Iraq on a 16-month timetable." But while Moran raised the subject twice, Obama got plenty of time to recite his views with the two answers consuming a lengthy 50 or so seconds each and a third, about whether given the success of the surge he'd support it now, he got 25 seconds of air time -- meaning Obama three answers took up more than half of Moran's story. The tree doesn't grow far from the apple. 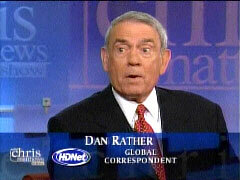 A little under two years after Katie Couric, Dan Rather's successor as anchor of the CBS Evening News, suggested just before the 2006 election that President Bush was manipulating gas prices to benefit Republican candidates, on the syndicated Chris Matthews Show over the weekend a conspiratorial Rather predicted "the people who can affect the price of oil would prefer a Republican" presidential victory, so "watch the price of oil." Rather didn't identify these people, but presumably he meant Big Oil executives who he thinks can raise or lower prices at their whim. In the "Tell me something I don't know" segment, Rather told Matthews: "Things to watch with the thought in mind many people vote their pocketbooks when it comes to voting for President: price of oil. The price of oil has been high. The people who can affect the price of oil would prefer a Republican presidential candidate. Watch the price of oil. If it goes down, which it may very well it could help John McCain quite a bit." More than three times as many Americans see a media tilt in favor of Democrat Barack Obama than toward Republican John McCain. A Rasmussen Reports telephone survey released Monday, of 1,000 likely voters, "found that 49 percent of voters believe most reporters will try to help Obama with their coverage, up from 44 percent a month ago," compared to a piddling 14 percent who "believe most reporters will try to help John McCain win" while "just one voter in four (24%) believes that most reporters will try to offer unbiased coverage." Exactly half, 50 percent, "believe the media makes economic conditions appear worse than they really are," a separate Rasmussen Reports telephone survey posted on Monday determined. That poll discovered "a plurality of Americans (41%) similarly believe that the media has tried to make the war in Iraq appear worse that it really is, while 26 percent say reporters have made it look better than reality and 25 percent think they've portrayed it accurately." "You have one candidate, Barack Obama, getting more than twice as many covers, Time and Newsweek, than John McCain -- and just look at some. We pulled out some Newsweek covers here. Look: Obama. Obama. Obama. It's a small picture. Obama. Obama. At that point, there is clearly an imbalance. The sheer volume becomes an imbalance..."
"Far more Americans believe that the press coverage has favored Barack Obama than think it has favored Hillary Clinton," a just-released survey, from the Pew Research Center for the People and the Press, discovered in determining 37 percent recognize a bias in favor of Obama. Even 35 percent of Democrats "see a pro-Obama bias" compared to 45 percent of Republicans and 40 percnt of independents. The poll, of about 1,000 Americans taken in late May, found about the same percentage of Republicans and Democrats rely on MSNBC for campaign news, but: "Far more Republicans (24%) than Democrats (10%) get most of their campaign news from Fox [News Channel], while the opposite is true for CNN: 24% of Democrats look to CNN compared with just 13% of Republicans." ....A plurality of Democrats -- 37% -- say most reporters try to offer unbiased coverage of the campaign. Twenty-seven percent (27%) believe most reporters are trying to help Obama and 21% in Obama's party think reporters are trying to help McCain. Among Republicans, 78% believe reporters are trying to help Obama and 10% see most offering unbiased coverage. As for unaffiliated voters, 50% see a pro-Obama bias and 21% see unbiased coverage. Just 12% of those not affiliated with either major party believe the reporters are trying to help McCain. In a more general sense, 45% say that most reporters would hide information if it hurt the candidate they wanted to win. Just 30% disagree and 25% are not sure. Democrats are evenly divided as to whether a reporter would release such information while Republicans and unaffiliated voters have less confidence in the reporters. Republicans and unaffiliated voters are more likely to trust campaign information from family and friends than from reporters. Democrats are evenly divided as to who they would trust more. Engineers, in the aerospace industry and elsewhere, calculate something called the "mean time between failures." 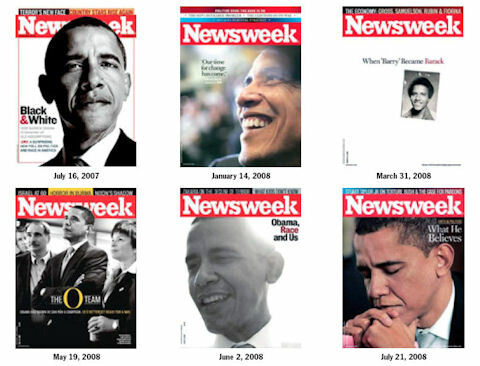 THE SCRAPBOOK has made an analogous calculation-what we term the Mean Time Between Newsweek Obama Covers (MTBNOC). We can reveal here the results of our preliminary investigations, which show that the MTBNOC is falling at an alarming rate. In mid-October, by our back-of-the-envelope extrapolation, every issue of Newsweek will feature His Self-Importance on the cover. 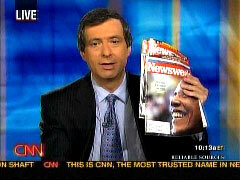 Shortly thereafter, if our calculations are correct, the magazine will be forced to appear more frequently-twice a week, at first, and as a rebranded Newsdaily by early November, in order to accommodate the increasingly frequent need of editors to showcase Barack-the-Transcendent on their cover. Uncertainty is introduced into the equation at that point owing to Election Day, when the American people are allowed to weigh in with their own judgment on the merits of their prospective savior. Should the voters unaccountably fail to do their duty, some predict Newsweek may suspend publication in protest. Good Morning America co-host Diane Sawyer on Monday quizzed John McCain on whether the media are gushing too much over Barack Obama's Middle East trip. She then proceeded to cite Obama talking points on the visit. First, Sawyer wondered: "A quick question about the press coverage, if I can. [Obama's] there with a lot of reporters and it's been widely reported-" At this point, the Arizona Senator started chuckling. A surprised Sawyer continued: "You're laughing. Do you think the press coverage is unfair?" McCain wryly responded: "That's up to the American people to decide, Diane. It is what it is." A few seconds earlier, Sawyer appeared to preemptively answer her query on media bias. The ABC journalist prompted: "You have criticized Senator Obama in the past for not going to Iraq and getting a fresh assessment. He is in Iraq as we speak this morning. Does this take care of it?" The subtext of the question sounded very much like "He went to Iraq. Will you leave him alone now?" Never mind the fact that McCain has been to the area eight times and Obama only two. Sawyer repeatedly borrowed statements from Obama talking points. And at one point, a second question resulted in a laugh from McCain: "You know, his camp has said that in fact he was out ahead of you on Afghanistan [McCain snorts], where the real problem is today." She then observed that "Senator Obama says that he was warning of this all along" and played a clip of the Democrat calling the situation in Afghanistan "precarious and urgent." This resulted in an exchange in which Sawyer attempted to goad the GOP candidate into using Obama's words: "Do you agree the situation in Afghanistan is precarious and urgent?" McCain concurred that the country faces significant challenges, but didn't use the exact phrasing. Sawyer tried again: "Not precarious and urgent?" The host also speculated, "Does [Obama] deserve the credit for saying that there should be more troops in Afghanistan?" So, perhaps Sawyer's question about media bias was rhetorical? 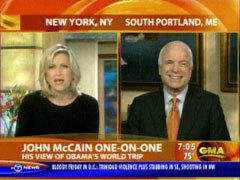 DIANE SAWYER: And we turn now to the race for '08, Barack Obama's opponent, Republican presidential candidate John McCain. He joined us just a few minutes ago from South Portland, Maine. Senator McCain, good to have you with us this morning. Good morning. SENATOR JOHN MCCAIN: Good morning, Diane. SAWYER: You have criticized Senator Obama in the past for not going to Iraq and getting a fresh assessment. He is in Iraq as we speak this morning. Does this take care of it? MCCAIN: Well, I believe that he'll be able to -- I know that he'll be able to have the opportunity to see the success of the surge. It has succeeded. This is the same strategy that he voted against. Railed against. Campaigned for his nomination and obtained his nomination in opposition. He was wrong about the surge. It is succeeding. And we are winning and I hope he will, he will agree that he had a fundamental misjudgment of the need for this change in strategy which has succeeded, which is allowing us to win this war. SAWYER: A quick question about the press coverage, if I can. He's there with a lot of reporters and it's been widely reported-- [McCain starts chuckling to himself.] You're laughing. Do you think the press coverage is unfair? MCCAIN: That's up to the American people to decide, Diane. It is what it is. SAWYER: You know, his camp has said that in fact he was out ahead of you on Afghanistan [McCain snorts], where the real problem is today. The level of violence has increased with more U.S. And NATO troops killed in June in Afghanistan than were in Iraq. The Taliban resurging and also Senator Obama says that he was warning of this all along and I'm going to play a bite from yesterday. SENATOR BARACK OBAMA ["Face the Nation" clip]: I believe U.S. troop levels need to increase. And I've -- for at least a year now -- have called for two additional brigades, perhaps three. The situation is precarious and urgent here in Afghanistan. And I believe this has to be our central focus -- the central front on our battle against terrorism. SAWYER: Does he deserve the credit for saying that there should be more troops in Afghanistan? And now the chairman of the joint chiefs is saying just the same thing. MCCAIN: Actually, the chairman of joint chiefs said yesterday it would be very dangerous to do what Senator Obama wants to do Iraq. He said the fragile victory that we're succeeding and gaining would be all placed at risk if we did what Senator Obama wanted. Look, you don't have to choose to lose in Iraq in order to succeed in Afghanistan. Of course, I've been following closely the events in Afghanistan. I gave speeches in Germany talking about the need for more NATO troops, more U.S. troops but it's more complicated than that, Diane. MCCAIN: It's not just a matter of troops. It's a matter of our relationship with Pakistan. It's relations with a new strategy which will -- can and will succeed. The same kind that worked in Iraq, which he has rejected. And we can succeed there, but, it's going to be tough. MCCAIN: It is very tough. If we had lost in Iraq, the complications in Afghanistan would have been enormously more difficult. SAWYER: But the chairman of the joint chiefs says I need the surge. I need the additional brigades. But "I don't have troops that I can reach for to send into Afghanistan until I have reduced requirements in Iraq." So, in the sense, they are linked. The troops in Iraq and the availability of troops for Afghanistan. My question is, when will you have enough troops to send to Afghanistan? MCCAIN: Oh, I'm sure fairly soon. But it will be dictated by the conditions on the ground. Look, it's like any counter-insurgency or strategy that succeeds. We will be able to free up troops to go to Afghanistan. But if we abandon Iraq and have specific dates for withdrawal-- We would have been out last March, this previous March, if we had done what Senator Obama wanted to do. He was wrong then. He was wrong now. And he should admit that he was wrong. That might help us succeed in Afghanistan, and we will free up additional troops as we succeed in Iraq and come home in victory and honor. SAWYER: Do you agree the situation in Afghanistan is precarious and urgent? MCCAIN: Well, I think it's very serious. I think it's a serious situation. MCCAIN: Oh, I don't know exactly -- run through the vocabulary. But it's a very serious situation. But there's a lot of things we need to do. We have a lot of work to do and I'm afraid that it's a very hard struggle, particularly given the situation on the Iraq/Pakistan border. And I would not announce that I'm going to attack Pakistan as Senator Obama did when he was-- during his campaign. But most importantly, he railed against, voted against and said the surge wouldn't work. He said it wouldn't work and couldn't work and has failed to acknowledge. It did work and we have succeeded. Thank God. SAWYER: I can't let you leave, Senator McCain, this morning, without making one more valiant attempt at the vice presidential question. Can tell me anything new about the timetable and how many people on your list now? MCCAIN: Diane, I would love to, but I can't. And I'm sure you understand. But I also understand why you try. SAWYER: If you'd love to, why not give yourself a break this morning and just tell us. MCCAIN: Thank you, Diane. We're still going through the process. SAWYER: Senator McCain thanks so much for being with us. SAWYER: Good to have you. Later, when interviewing McCain, Harry Smith also brought up Maliki's comments: "But one of the other things that -- one of the other things that he [Obama] has said is that maybe the troops should be out within the next 18 months, an idea that Prime Minister Al Maliki basically agrees with. Maybe the surge, in fact, did work. Is it time for American troops to start coming home?" That statement was in response to McCain pointing out to Smith that: "We are winning the war. And Senator Obama was wrong. He railed against it. He voted against the surge. And he said it would fail. He was wrong there." During the clip of Logan's interview with Obama, the foreign correspondent helped summarize Obama's policy toward Afghanistan: "Well, Senator Obama told us that he'd been talking to U.S. commanders and Afghan leaders on the ground here in Afghanistan. And his assessment of the situation is that it's precarious and urgent and requires immediate action...Senator Obama told us more U.S. troops would only be part of the solution. And an Obama Administration would make pressing Pakistan a priority, pushing the government there to get more serious about clamping down on Al Qaeda and Taliban extremists operating out of its remote tribal areas." JULIE CHEN: Breaking news. Barack Obama arrives in Iraq overnight as he and John McCain trade jabs over which one has the right prescription for peace. We'll hear from them both this morning. JULIE CHEN: But first, Senator Barack Obama touched down early this morning in Baghdad. His latest stop on his highly anticipated trip across south Asia, the Middle East, and Europe. Obama started his trip last week, leaving from Andrews Air Force base. On Friday he arrived in Kuwait before visiting Kabul, Afghanistan on Saturday. He returned to Kuwait Sunday before arriving in Iraq very early this morning. Joining us now from Baghdad with more on Obama's visit is Richard Oppel of the New York Times. Richard, good morning to you. RICHARD OPPEL: Good morning, Julie. CHEN: How is the government there in Iraq receiving Senator Obama? OPPEL: Well, he's got a busy day today. He's meeting with Prime Minister Maliki, with President Talibani, with General Petraeus, and other top Iraqi and American leaders. And he's expected to talk about the future of troop levels here in Iraq and other crucial issues facing Iraq and the United States. CHEN: There was some controversy over the past weekend over an article that appeared in a German magazine because Obama was saying that he wants, if he gets into the Oval Office, he wants to start moving forward with moving troops out of Iraq. And Maliki was quoted as saying that he was in support of this. What is the latest with that? OPPEL: Well, that's interesting. That's right. That's what Maliki was quoted as saying. U.S. officials then got in touch with Maliki aids and said 'do you realize the ramifications of your comments and how that is playing across the world?' Maliki then issued a statement claiming that he had been mis-characterized or mis -- or the translation was poor. That statement was distributed by the American military. But one of my colleagues, Sabrina Tavernese, last night was able to actually gain access to the audio tape of the actual interview and, in fact -- and in fact Maliki did -- he was quoted accurately. He did express a clear affinity for Obama's 16 month proposal. CHEN: Well, it'll be interesting to see in a few hours what the two gentleman say to each other. Richard Oppel from the New York Times, thank you. Earlier on his trip abroad while in Afghanistan, Senator Obama sat down exclusively with CBS News chief foreign affairs correspondent Lara Logan. LARA LOGAN: Good morning Julie. Well, Senator Obama told us that he'd been talking to U.S. commanders and Afghan leaders on the ground here in Afghanistan. And his assessment of the situation is that it's precarious and urgent and requires immediate action. BARACK OBAMA: There's starting to be a growing consensus that it's time for us to withdraw some of our combat troops out of Iraq, deploy them here in Afghanistan and I think we have to seize that opportunity. Now's the time for us to do it. LOGAN: What will those extra troops do in Afghanistan? What will their specific task be and how will it be any different from what they're already doing? OBAMA: Well, you know, in talking to the commanders here, a couple of things. Number one, if they had more troops, they're going to have more mobility and more flexibility in terms of going after Al Qaeda targets and Taliban targets. I think along the borders especially. There are a whole host of activities that right now are not being done because folks aren't freed up from the immediate day to day battles that are having to take place. The commanders are clear that they could use those two and maybe three brigades immediately. And one of the things I think it's important for us to do is to begin planning for those brigades now. If we wait until the next administration it could be a year before we get those additional troops on the ground here in Afghanistan. And I think that would be a mistake. LOGAN: Senator Obama told us more U.S. troops would only be part of the solution. And an Obama Administration would make pressing Pakistan a priority, pushing the government there to get more serious about clamping down on Al Qaeda and Taliban extremists operating out of its remote tribal areas. But how do you compel Pakistan to act? OBAMA: Well, you know, I think that the U.S. government provides an awful lot of aid to Pakistan, provides a lot of military support to Pakistan. And to send a clear message to Pakistan that this is important to them as well as to us that I think -- that message has not been sent. LOGAN: And under what circumstances would you authorize unilateral U.S. action against targets inside the tribal areas? LOGAN -if U.S. forces had Osama Bin Laden in their sights and the Pakistanis said no that they wouldn't fire, they wouldn't go after him? OBAMA: Oh, I think actually this is current doctrine. There was some dispute when I said this last August, both the administration and some of my opponents suggested 'well, you know, you shouldn't go around saying that.' But I don't think there's any doubt that that should be our policy and will continue to be our policy. LOGAN: But it is the current policy? OBAMA: I believe it is the current policy. LOGAN: So there's no change then? OBAMA: I don't think there's going to be a change there. I think that in order for us to be successful it's not going to be enough just to engage in the occasional shot fired. We've got training camps that are growing and multiplying. LOGAN: Would you take out all those training camps? OBAMA: Well, I think that what we'd like to see is the Pakistani government take out those training camps. LOGAN: And if they won't? OBAMA: Well, I think that we've got to work with them so they will. LOGAN: Obama said there would be huge symbolic value in capturing or killing Osama Bin Laden, but that alone wouldn't be enough to destroy Al Qaeda. Julie. CHEN: Lara Logan. Thanks Lara. HARRY SMITH: And joining us this morning from Portland, Maine, is Senator John McCain. Good morning, Senator. JOHN MCCAIN: Good morning, Harry. SMITH: You know, when you have the network anchors chasing your opponent across the Middle East it's a little hard to make news. What is your strategy to get folks to pay attention to your message over the next couple of days? SMITH: But one of the other things that -- one of the other things that he has said is that maybe the troops should be out within the next 18 months, an idea that Prime Minister Al Maliki basically agrees with. Maybe the surge, in fact, did work. Is it time for American troops to start coming home? 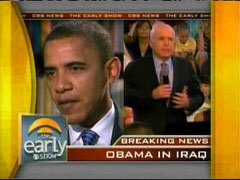 MCCAIN: Well, Prime Minister Maliki agreed with President Bush that it would be conditions-based. If Senator Obama had had his way they'd have been out last March. And we'd have never had the surge and we would have failed and we would have then faced enormous consequences of defeat both there and it would've -- in Iraq -- and it would've affected Afghanistan. If we'd chosen to lose in Iraq we would've had a very serious problem, more serious problem, in Afghanistan as well. So, as Admiral Mullen, the Chairman of the Joint Chiefs of Staff, said yesterday, it would be very dangerous to do what Senator Obama wants to do. And he still fails to acknowledge that the surge succeeded. He said it would fail. He voted against it and railed against it. The conditions there would be very different where he's visiting as far as security is concerned and as far as our progress is concerned. MCCAIN: If we had done what he wanted to do. SMITH: Let me ask you this, with all this attention this week about foreign policy, which would be your higher priority when you become President of the United States, the economy or foreign policy? MCCAIN: Oh, I think you have to do both. Obviously the security of our citizens is a president's first priority. But the economy is hurting very badly. We need to do a lot of things now. Nuclear power, which Senator Obama opposes. Offshore drilling, which he opposes. We've got to have hybrid, hydrogen. We've got to have wind, solar, tide. We've got to embark on a national mission for energy independence, keep people in their homes, and recover the economy. So, I think Americans are hurting very badly and it's of the highest priority. SMITH: Senator John McCain, we thank you very much for your time this morning. Take care, sir. The New York Times isn't about to give John McCain a break, setting stringent standards before it will take a pro-surge op-ed from him, even though it printed Obama's pro-withdrawal op-ed last week. When Hillary dropped out under a wave of hostile coverage, she left John McCain the only person standing between Barack Obama and a history-making presidency. With Obama rocking waves of positive coverage overseas, the media tide is out for the Republican nominee, and the Times surely isn't going to give McCain any breaks now. The same New York Times that endorsed McCain (albeit in hold-your-nose fashion) during the Republican primaries now refuses to run an op-ed by him that: laid out recent successes in Iraq; said Obama was wrong in opposing the surge; and accused the Democrat of having "learned nothing from recent history." Times' op-ed editor David Shipley, a speechwriter for President Bill Clinton in the 1990s, e-mailed McCain's staff: "I'm not going to be able to accept this piece as currently written." Yet the McCain op-ed was in response to one from Obama, "My Plan for Iraq," that had appeared in the Times on July 14. Did the Times at least invite the McCain camp to submit an op-ed in defense of the war and the surge (to accompany Obama's call for withdrawal) before Obama's op-ed appeared? Shipley said he wanted something more forward-looking that paralleled more closely with Obama's piece, which mentioned McCain only twice while sketching out a vision of withdrawing troops from Iraq. The piece McCain submitted to the Times attacked Obama on his past statements on the surge and also went after points from Obama's NYT op-ed. Shipley laid out some pretty stringent demands on McCain: "It would be terrific to have an article from Senator McCain that mirrors Senator Obama's piece. To that end, the article would have to articulate, in concrete terms, how Senator McCain defines victory in Iraq. It would also have to lay out a clear plan for achieving victory -- with troops levels, timetables and measures for compelling the Iraqis to cooperate. And it would need to describe the Senator's Afghanistan strategy, spelling out how it meshes with his Iraq plan." The last McCain op-ed to appear in the Times came in March 2003 -- ironically, a pro-war piece written on the eve of the Iraq War titled "The Right War for the Right Reasons." The last op-ed from Obama to appear in the Times (before last week) came in June 2005. "Grounding a Pandemic," co-written with Republican Sen. Richard Lugar, warned of the threat of an "avian flu pandemic." For Obama, bird flu evidently tops Saddam Hussein as a plausible imminent threat. 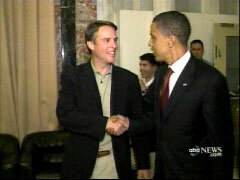 ABC's Terry Moran, who back in 2006 was already enthralled with Barack Obama ("You can see it in the crowds. The thrill, the hope. How they surge toward him. You're looking at an American political phenomenon"), on Monday night from Iraq refrained from such infatuation as ABC's World News, nonetheless, gave Obama a lengthy platform to espouse his Iraq policy. Moran began his lead story by trumpeting how "Barack Obama came to Baghdad, and he brought his star power with him. Hundreds of U.S. troops and State Department personnel mobbed Obama at the embassy here." The rest of Moran's story, however, focused on "what has become an open disagreement between military commanders here and Obama, over his plan to withdraw all U.S. combat troops from Iraq on a 16-month timetable." But while Moran raised the subject twice, Obama got plenty of time to recite his views with the two answers consuming a lengthy 50 or so seconds each and a third, about whether given the success of the surge he'd support it now, he got 25 seconds of air time -- meaning Obama three answers took up more than half of Moran's story. Anchor Charles Gibson, who will get a one-on-one with Obama for Wednesday's World News, on Monday introduced Moran by advising: "The trip has renewed focus on the cornerstone of Obama's foreign policy, the withdrawal of all combat troops from Iraq by 2010. That stand got support, at least initially, from the Iraqi prime minister over the weekend, then came under renewed attack today from Senator John McCain." Moran reported late in his piece: "The surge of U.S. troops, combined with ordinary Iraqis' rejection of both al-Qaeda and Shiite extremists, has transformed the country. Attacks are down by more than 80 percent nationwide. U.S. combat casualties have plummeted -- five this month so far, compared with 78 last July. And Baghdad has a pulse again." Viewers then saw Moran inquire of Obama: "If you had to do it over again, knowing what you know now, would you support the surge?" Obama responded "no" before elaborating. More of Moran's interview aired on Monday's Nightline and Tuesday's Good Morning America. On Monday Moran wasn't as gentle with Obama as he had been back in March. In an exclusive interview just after Obama's race speech, Moran tossed softballs and cued up Obama to expound on his views about race. He never challenged Obama on his awareness of the Reverend Jeremiah Wright's hate speech. Instead, he hailed Obama for how in the "remarkable speech" he "tried to talk about race honestly." Monday's (March 18) Nightline featured an "exclusive" interview with Obama in which ABC's Terry Moran tossed softballs and cued up Obama to expound on his views about race. He never challenged Obama on his awareness of Wright's hate speech. Moran trumpeted: "Obama tried the almost impossible in America: He tried to talk about race honestly, about injustice, about white resentment, about black anger." What Obama has to worry about now is that everything he is trying to say that isn't about race -- his views on Iraq, the economy, health care, education -- all that will get drowned out in our old, predictable ways of thinking about race. The big question now for Obama -- and for the rest of us, really -- is there another way, another way to think and communicate across the color line? On Monday night's edition of Nightline, just hours before the polls opened for Tuesday's midterm election, ABC's Terry Moran prematurely promoted a potential 2008 Democratic presidential contender. Moran went along with Illinois Senator Barack Obama as he campaigned for Democrats across the country. Moran's piece was full of praise for the "American political phenomenon," whom, according to Moran, millions see as "the savior of the Democratic Party." Moran gushed on the November 6 show: "You can see it in the crowds. The thrill, the hope. How they surge toward him. You're looking at an American political phenomenon. In state after state, in the furious final days of this crucial campaign, Illinois Senator Barack Obama has been the Democrat's not-so-secret get-out-the-vote weapon. He inspires the party faithful and many others, like no one else on the scene today...And the question you can sense on everyone's mind, as they listen so intently to him, is he the one? Is Barack Obama the man, the black man, who could lead the Democrats back to the White House and maybe even unite the country?" CHARLES GIBSON: Good evening. This is a special edition of World News with a single sponsor and more time for news. And we begin with Barack Obama, who is in Iraq now. The trip has renewed focus on the cornerstone of Obama's foreign policy, the withdrawal of all combat troops from Iraq by 2010. That stand got support, at least initially, from the Iraqi prime minister over the weekend, then came under renewed attack today from Senator John McCain. 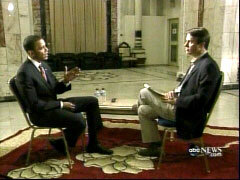 ABC's Terry Moran is in Baghdad and sat down with Obama today. Terry, good evening. TERRY MORAN: Barack Obama came to Baghdad, and he brought his star power with him. Hundreds of U.S. troops and State Department personnel mobbed Obama at the embassy here. In brief remarks, he offered them his gratitude and support. BARACK OBAMA: We just want to say thank you. MORAN: That scene came right after his dinner with General David Petraeus, the U.S. commander here. And then we sat down with him to talk about what has become an open disagreement between military commanders here and Obama, over his plan to withdraw all U.S. combat troops from Iraq on a 16-month timetable. Did General Petraeus talk about military concerns about your timetable? OBAMA: You know, I would characterize the concerns differently. I don't think that they're deep concerns about the notion of a pullout per se. There are deep concerns about, from their perspective, a timetable that doesn't take into account what they anticipate might be some sort of change in conditions. And this is what I mean when I say we play different roles. My job is to think about the national security interests as a whole, and to have to weigh and balance risks, in Afghanistan, in Iraq. Their job is just to get the job done here. And I completely understand that. MORAN: How do you know what I'm going to ask? OBAMA: Well, then if I don't get it right, then you can ask it again. Is to get boxed in into what I consider two false choices, which is either I have a rigid time line of such and such a date, come hell or high water, we've gotten our combat troops out, and I am blind to anything that happens in the intervening six months or 16 months. Or, alternatively, I am completely deferring to whatever the commanders on the ground says, which is what George Bush says he's doing, in which case I'm not doing my job as Commander-in-Chief. MORAN: This is Obama's second trip to Iraq. His first was in January 2006 when the country was plunged into horrific violence. But the surge of U.S. troops, combined with ordinary Iraqis' rejection of both al-Qaeda and Shiite extremists, has transformed the country. Attacks are down by more than 80 percent nationwide. U.S. combat casualties have plummeted -- five this month so far, compared with 78 last July. And Baghdad has a pulse again. If you had to do it over again, knowing what you know now, would you support the surge? OBAMA: Well, no, keep in mind, these kinds of hypotheticals are very difficult. You know, hindsight is 20/20. But I think that, what I am absolutely convinced of is that at that time, we had to change the political debate because the view of the Bush administration at that time was one that I just disagreed with. MORAN: And so, when pressed, Barack Obama says he still would have opposed the surge. He did admit to me, however, that he didn't anticipate what people here sometimes call the Iraqi surge, the uprising of Iraqis against al-Qaeda extremists and Shiite extremists. And he said he did not anticipate that. But he is insisting that he's focusing forward on what he believes needs to be done, setting that timetable for withdrawal. "Things to watch with the thought in mind many people vote their pocketbooks when it comes to voting for President: price of oil. The price of oil has been high. The people who can affect the price of oil would prefer a Republican presidential candidate. Watch the price of oil. If it goes down, which it may very well it could help John McCain quite a bit." Matthews tried to clarify: "October surprise?" Rather promised "October or before" and then anticipated "you'll hear the argument, 'listen, we never were in a recession, it was a near recession but wasn't actually a recession.'" Of course, as things stand now, that would be the truth, but in Rather's eyes that apparently would reflect some kind of nefarious scheme to fool the public. 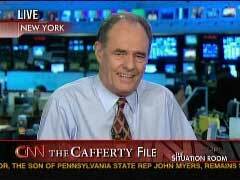 As conspiratorial as Rather, back in August of 2006 CNN's Jack Cafferty wondered "if the oil companies might not be pulling the price of gas down to help the Republicans get re-elected in the mid-term elections a couple of months away." Although a Monday CBS Evening News story included a soundbite from an expert dismissing the idea as "preposterous," the newscast treated a far-left conspiracy theory -- about how the Bush administration is somehow manipulating the pump price for gas to help in the election -- as credible and worthy enough to deserve a broadcast network story. Citing how the price of a gallon of gas has fallen to the lowest all year, anchor Katie Couric wondered: "Is this an election year present from President Bush to fellow Republicans?" 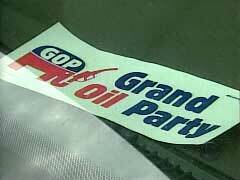 Over a shot of a "GOP: Grand Oil Party" bumper sticker laying on a dashboard, reporter Anthony Mason asserted: "Gas started going down just as the fall campaign started heating up. Coincidence? Some drivers don't think so." The man in the car insisted "I think it's basically a ploy to sort of get the American people to think, well, the economy is going good, let's vote Republican." Over headlines from Daily Kos and Huffington Post, Mason conceded you can "call the conspiracy theory crazy," but he touted how "it's spreading through Internet blogs and over the airwaves. And a recent poll found 42 percent of people actually believe the Bush administration has deliberately manipulated the price of gas to affect the election." Wednesday's USA Today reported that gasoline prices could be closer to $2 a gallon by Thanksgiving. The paper cited the end of the summer driving season and decreased demand as causes for this predicted decline. Not surprisingly, CNN's Jack Cafferty saw something more sinister at work. Before his daily "Cafferty File" segment during the 4pm EDT hour of The Situation Room on Wednesday afternoon, substitute anchor John King and news reader Zain Verjee discussed this report and cheered on lower gas prices as good news. Cafferty then spouted off the old liberal conspiracy theory connecting Republicans and Big Oil: "You know, if you were a real cynic, you could also wonder if the oil companies might not be pulling the price of gas down to help the Republicans get re-elected in the mid-term elections a couple of months away."